Suicide Squad, two gifts in one! - Poster to hang on the wall to decorate your home. 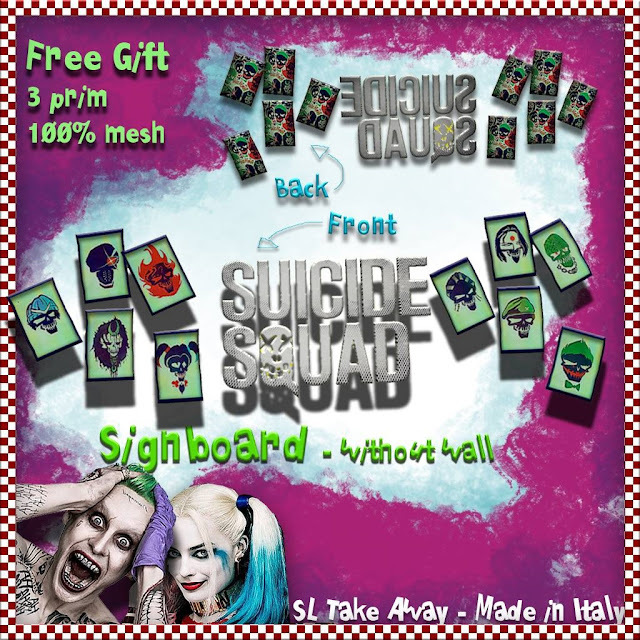 - Support panel to use as a background to take pictures, or as a shelf to hang on the wall. 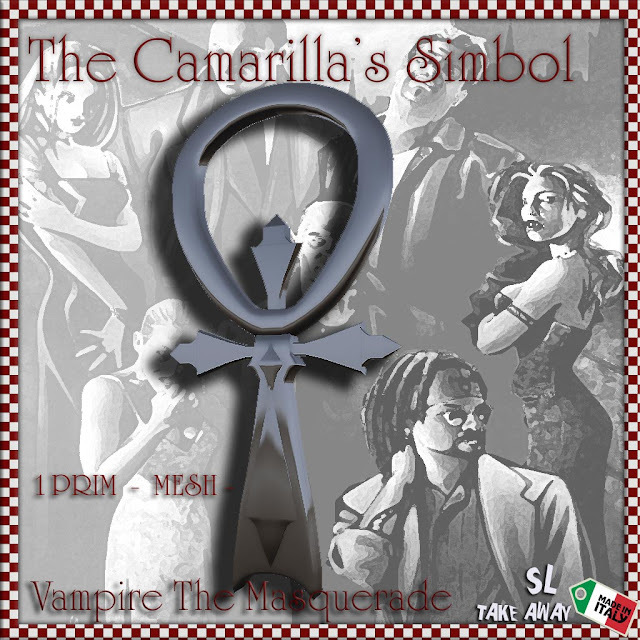 This is the symbol of The Camarilla with rare box, the largest of vampiric sects, a loose organization which ostensibly represents and protects all vampires by enforcing and promulgating the Masquerade. It is currently composed of six clans (formerly seven), though officially it considers all Kindred under its purview and welcomes any that obey its laws. 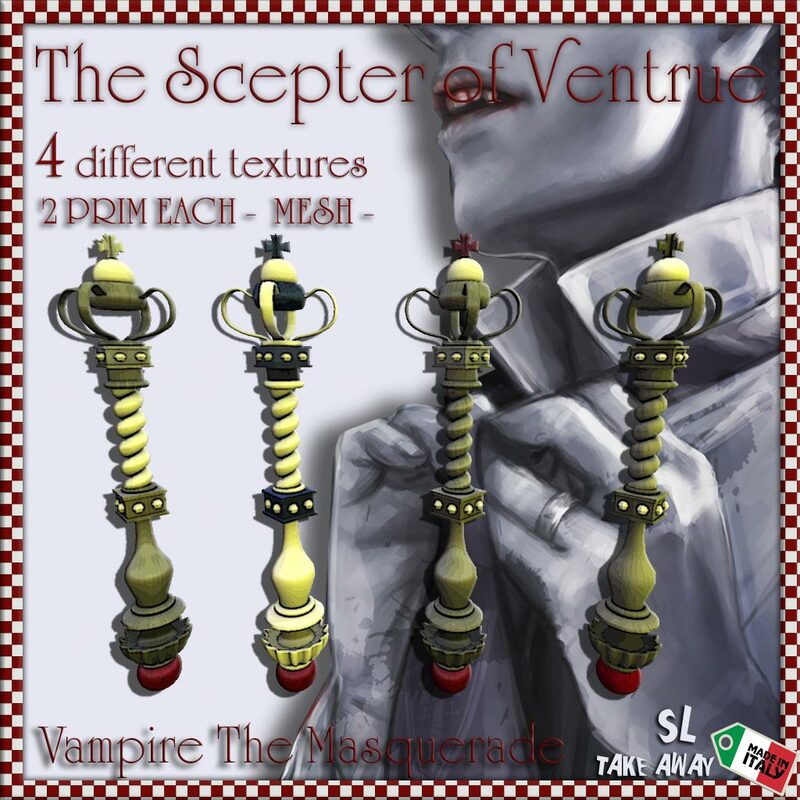 In addition to preventing the growing mortals masses from discovering the existence of vampires, the Camarilla aims to maintain the status quo of Kindred society; as such, much of its structure and traditions mirror that of Cainite society in feudal Europe in the Dark Ages, and places it at odds with the agenda of the Sabbat and Anarchs, both of whom seek to overthrow Kindred society. 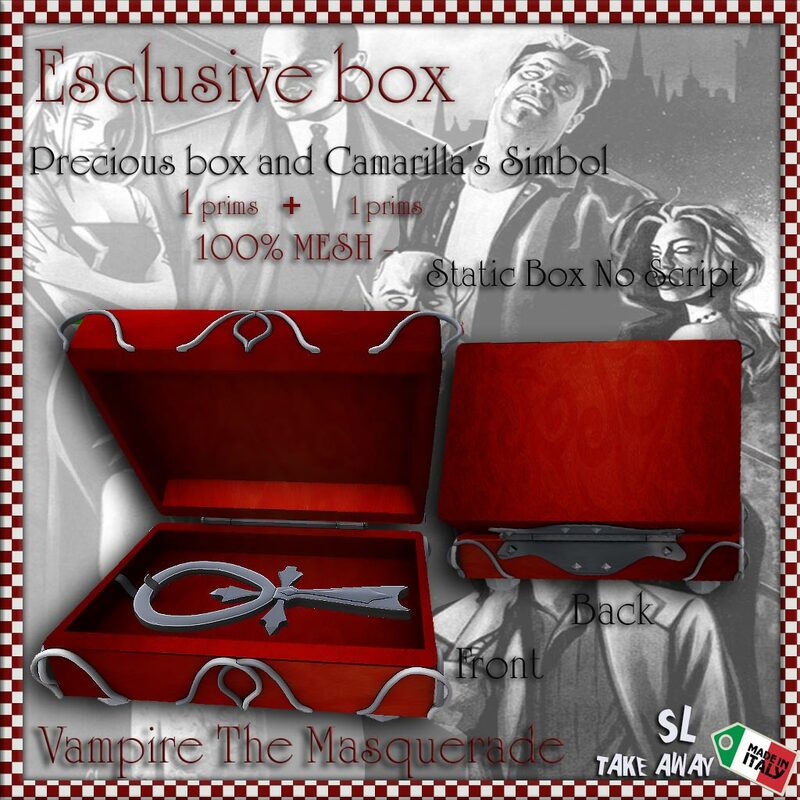 Elegant and refined box containing the symbol par excellence of Clan Ventrue. Elegant and refined box containing the symbol par excellence of Clan Malkavian, also called crazy or lunatics, the broken mirror. Inside the cover the words of Malkav, in this version in English. n.b. 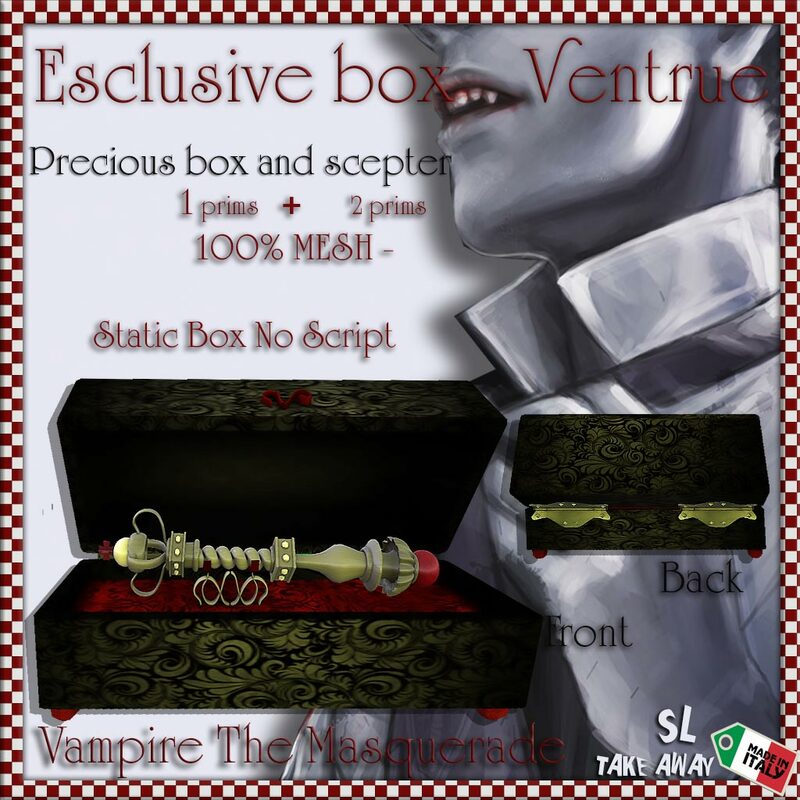 Anche una versione in lingua ITALIANA! his is the symbol of The Camarilla, the largest of vampiric sects, a loose organization which ostensibly represents and protects all vampires by enforcing and promulgating the Masquerade. It is currently composed of six clans (formerly seven), though officially it considers all Kindred under its purview and welcomes any that obey its laws. Elegant and refined scepter, symbol par excellence of Clan Ventrue. 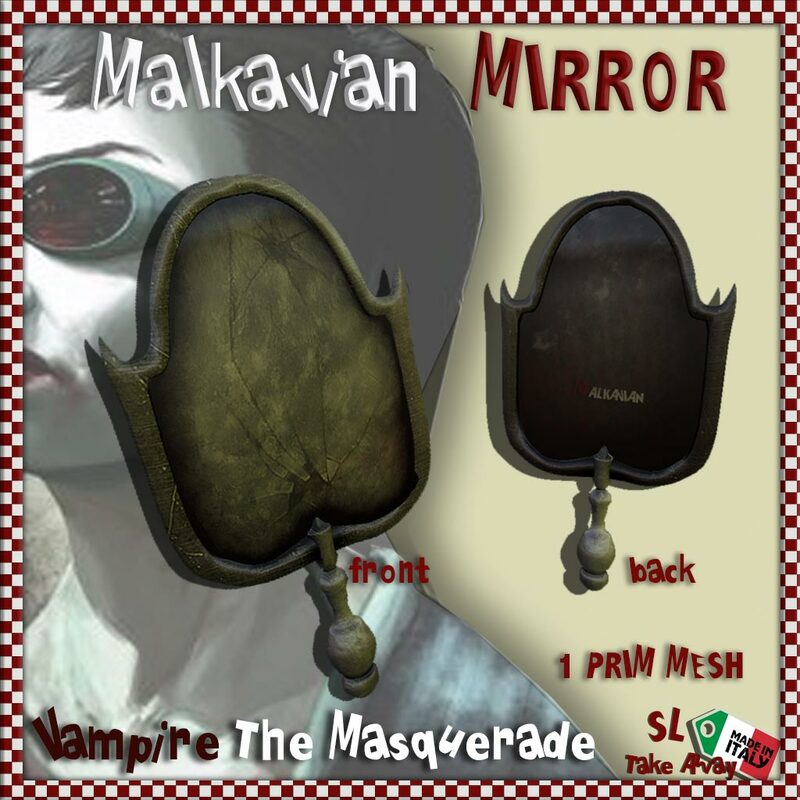 Elegant mirror, the symbol par excellence of Clan Malkavian, also called crazy or lunatics, the broken mirror. Happy Valentine's Day from SLTA !!! ANOTHER SPECIAL GIFT FROM SLTA!!! Totally mesh pillow, only 1 prim. Totally mesh 1 prim pillows, various fabric and colors.You can find them also for sale individually at our marketplace! 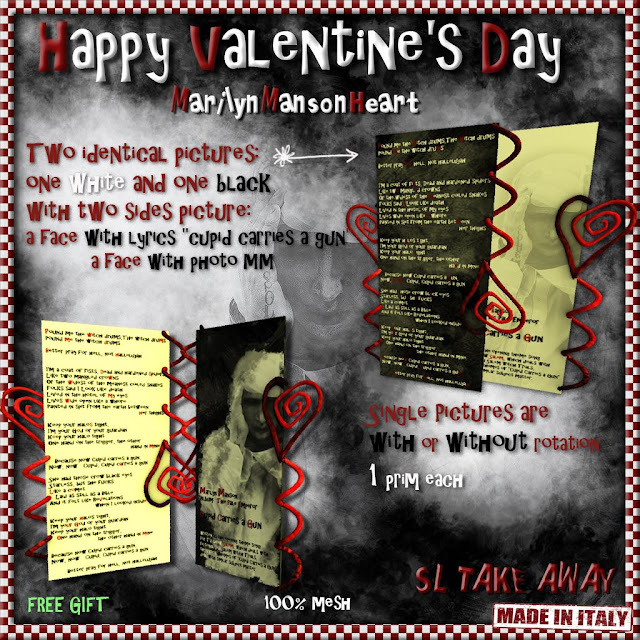 Special GIFT - MaNSoN Birthday Celebration!!! 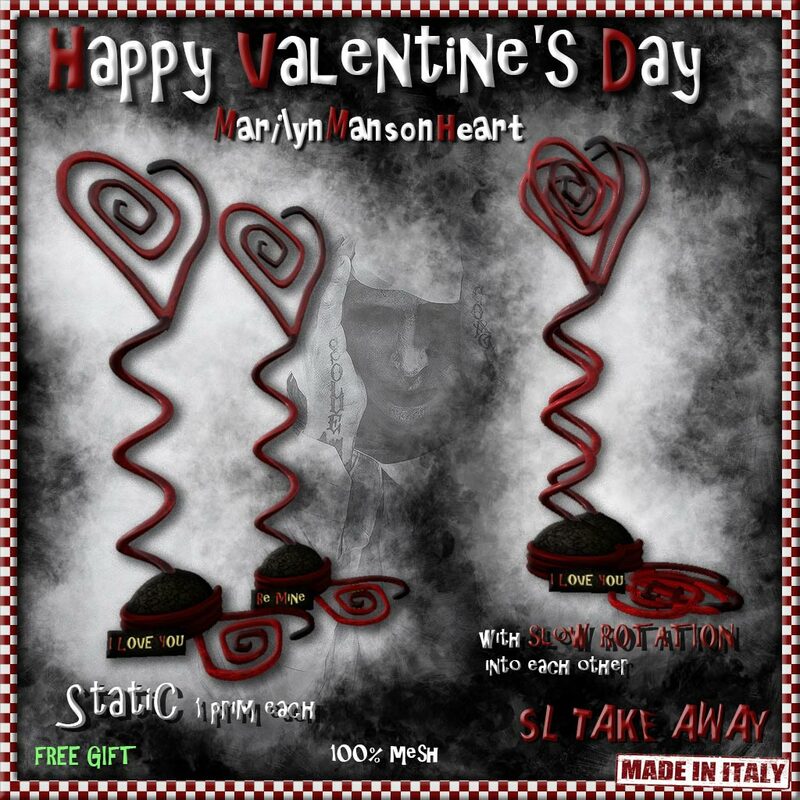 By the Staff of Second Life Take Away ..
To celebrate the 46th birthday of the Reverend !!! 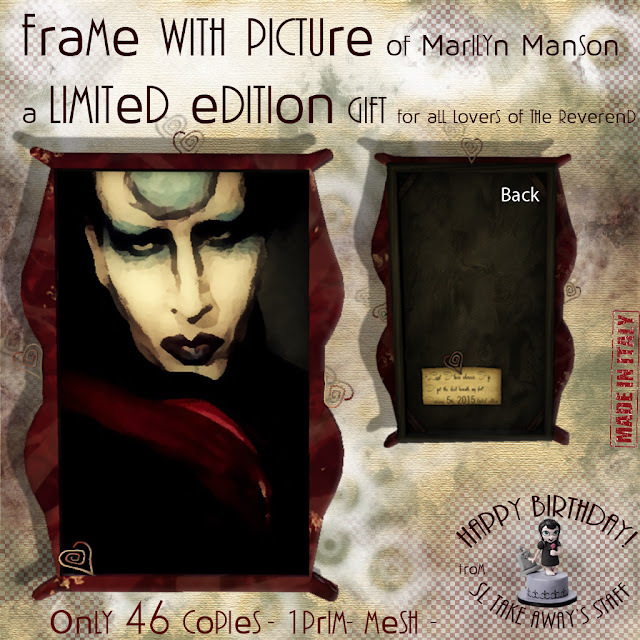 We are pleased to present a limited edition of 46 copies only, as the years of the Reverend, to all of our loyal customers and fans of Marilyn Manson. 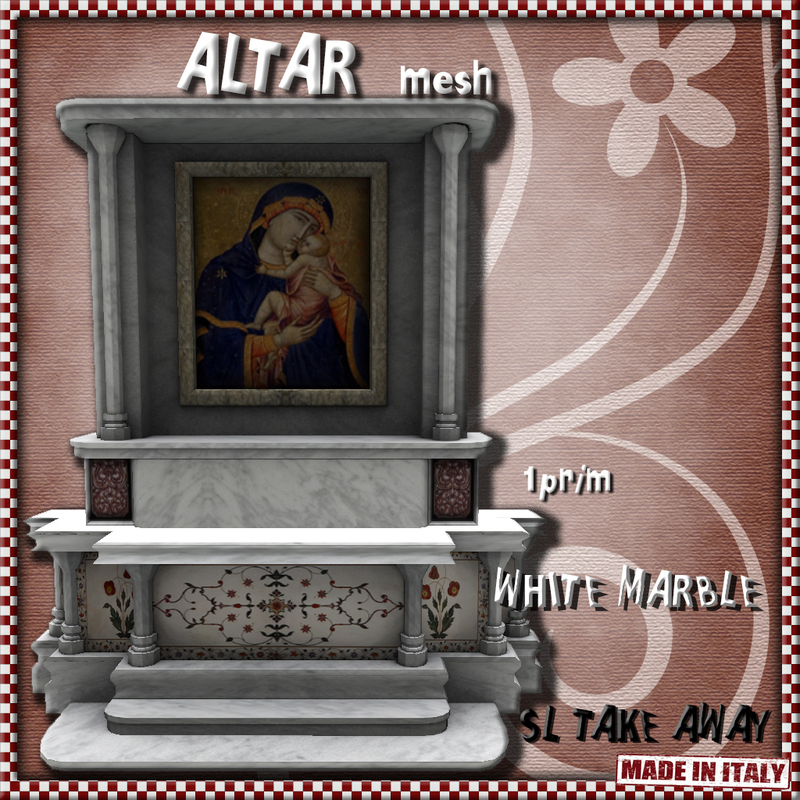 Major altar in white Carrara marble . Finely textured and decorated in Romanesque style. In center, a beautiful sacred image icon style, Mary holding the Baby. 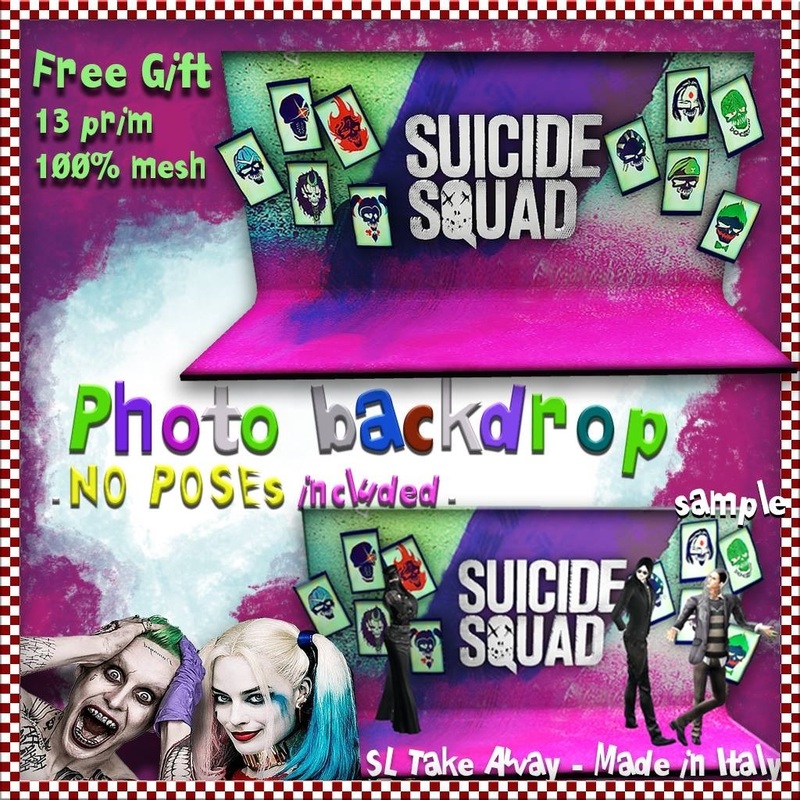 Totally mesh, only 1 prim.